Anyways, on to the important part of this post. The recipe! This cake consists of three layers; the soft bottom vanilla layer, the middle smooth and flavor bursting caramel layer, and the orange citrus gelato-like layer. Combined with some blueberries to achieve ice cream heaven. In blender or food processor blend together. Pour into 7×7 inch dish. I line mine with parchment paper to make it easier to remove and serve. Place layer in freezer to set up completely. Approximately 1 hour. In blender or food processor blend together all ingredients. Pour over frozen vanilla base layer and spread evenly. Place in freezer to set up. Approximately 1 hour. This layer most likely won’t freeze completely. Pouring top layer on semi-frozen caramel layer will work out just fine. In blender, blend together and pour mixture over caramel layer. Throw in some blueberries if your heart desires, if not leave as is. Place in freezer to set up completely. About 2-3 hours. Serve, enjoy!! 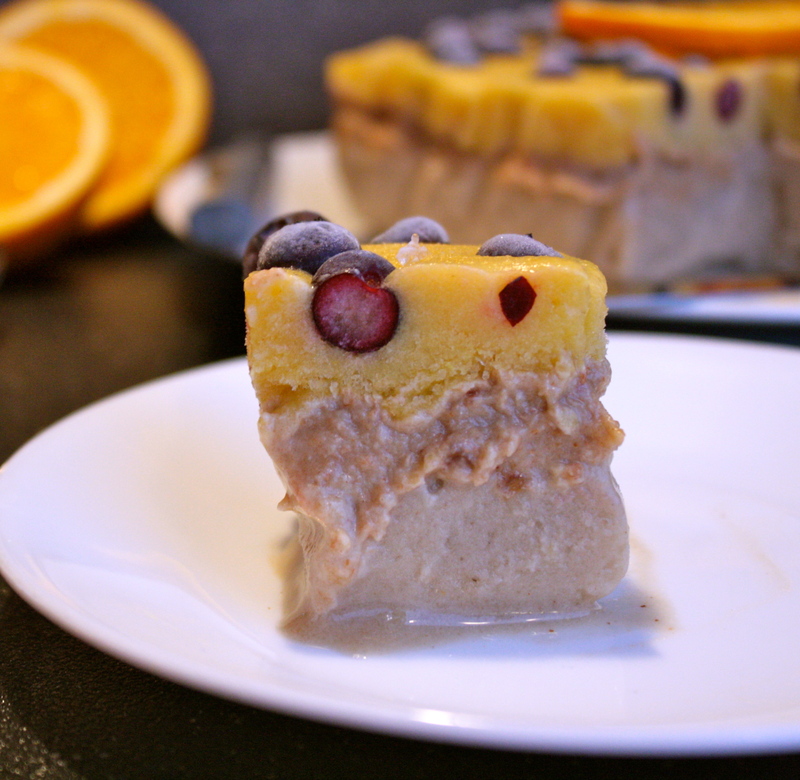 This entry was posted in Recipes and tagged gluten free, gluten free vegan, raw vegan, vegan, vegan cake, vegan dessert, vegan ice cream, vegan recipe on December 29, 2013 by Amanda - Create N Plate. ohh my gosh so trying this!